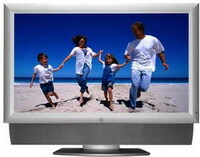 (without stand or speakers) 36.6" x 23.0" x 4.5"
With more than 2 million pixels, this state-of-the-art 1920 x 1080 progressive scan LCD display brings you the ultimate in digital video. A full range of inputs, including 2 DVI with HDCP connectors, lets you connect to a PC and the latest multimedia video sources. External tuner required for TV viewing.